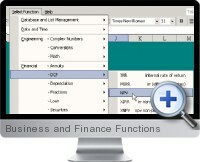 Business and Finance Functions for Excel is a function library for Microsoft Excel and is designed to make business plans, budgets, structured financing and cash flow less error prone, faster to build, easier to understand, more robust and easier to understand. Business and Finance Functions for Excel contains 465 functions written in C++ do the dirty work of projecting costs and revenues, coping with time periods, growth etc. The General Purpose group consists of the Date and Time Calculations, Special Dates, Time Value Of Money Analysis, Discounted Cash Flow, Mathematical Calculations, Range Operations, Text, Accounting And Tax, Miscellaneous categories. The Projections group consists of the Discrete Amount Projections (26 functions), Distributed Amount Projections (25 functions), Constant Rate Projections (16 functions), Stepped Rate Projections (24 functions), Interpolated and Curve-Fitted Projections (4 functions), Instantaneous Level Projections (28 functions), Levels Over Time Projections (11 functions), Projections NPV (15 functions) categories categories. The Industry group consists of the Real Estate, Banking, Oil and Gas categories. The Specialist group consists of the Projections NPV, Simulation Modeling, Treasury categories. Function Selector - Simply find the function on the menus, click on it and a template of the function is pasted into your currently highlighted cell. Quick Reference - an alternative help file in the form of quick look examples. Audit - Tells you what Business Functions you are using in your worksheet or workbook. Trace - Tells you where input errors are, which input variable was faulty, what calculations the function is doing and other BF functions being called. Help - Context sensitive and cross referenced, calling up help documentation for the function in the cell you are in on the spreadsheet. Examples to assist in the application of the functions. Utilities to aid the productivity such as Go to and Calculate. Monte Carlo - risk analysis including several functions for producing deviates from distributions such as Normal, Triangular etc. Tutorials - 3: Introduction , Projections and Discounted Cash Flow. Function Categories - including General Purpose, Projections, Industry and Specialist.